I pre-ordered the digital edition of this book several months ago when it was first announced, so I knew it would be arriving on my Kindle around 2:00 this morning. I was pleasantly surprised when it actually showed up at midnight, because I’m very nocturnal. Translation: by the time I went to bed around 2 AM, I’d read 81% of this novel. The Light Fantastic is the sequel to Lang’s own Immortal Coil, which, I confess, left me conflicted when I first read it. The adult part of me, the part that is an improviser and a writer, really liked it, though I felt that Data and Rhea’s relationship was both too fast, and not believable (this despite the fact that I liked Rhea as a character). The part of me that was 16 or 17 when TNG premiered on TV and crushed on Data had other issues, but adult-me was able to ignore them. But then David Mack gave us is Cold Equations trilogy, and those expanded upon Data 2.0’s mindset and choices, and gave us better insight into the Fellowship of AI, and left a door open for more with this beloved character. And now Lang has wrapped up a truly amazing arc. We get to find out how Data’s been spending the last two years of his life. We get a glimpse into his life with the newly restored Lal, his daughter, who is in the midst of the android equivalent of adolescence, and then she’s abducted – by Moriarty – yes, the hologram – and we’re thrown into a story that is both a mystery and a story about what it means to grow up, grow old, raise children, and explore one’s identity. Data as a father is both hilarious and heartbreaking – especially as he’s still acclimating to his new body and his permanently engaged emotions. Lal as a teenager is also hilarious, and frustrating, and it gave me new respect for the way my own mother must’ve felt when I was a teenager myself. Geordi, of course, is along for the ride, because no Sherlock can be without his Watson, and along the way we are introduced to a few favorite characters from both TNG and TOS. Overall, The Light Fantastic is a truly satisfying read, and if Data doesn’t sound exactly the way we’re accustomed to him sounding, well, he himself states in the novel that he isn’t entirely certain how much of him is HIM, and how much is leftover Noonian Soong. The tag, of course, teases a new mystery, and I have no idea if that will pan out, or if the soft canon of the novels will eventually merge with the soft canon of the STO game and the Countdown to Trek 2009 (in which Data was Captain of the Enterprise), but if it doesn’t, I would totally buy a series of intergalactic mysteries featuring Data and LaForge. Goes well with French-pressed coffee and a chocolate croissant. Cardassia Prime is home to a prideful people who, for centuries, forged alliances with those they believed would strengthen them and their place in the Alpha Quadrant, and expanded their empire at great cost to other worlds. For generations, dissenting voices were silenced by either fear or an early grave. When their wartime ally, the Dominion, suddenly turned on them, seeking to transform Cardassia into a tomb for every last member of their race, their old adversary—the United Federation of Planets— put an end to the carnage, and even now works to help rebuild Cardassia Prime. To celebrate this alliance, the Castellan of the Cardassian Union is to welcome the Federation president to Cardassia Prime. As a symbol of this deepening friendship, the U.S.S. Enterprise-E is tasked to carry the Cardassian ambassador to the Federation back home. For his part, Ambassador Elim Garak is working with Captain Jean-Luc Picard to oversee the diplomatic reception that will commemorate the last of Starfleet’s personnel finally leaving the homeworld. However, there are malevolent forces at work, who even now strive to “restore Cardassia to its proper place and glory,” and are willing to do anything to achieve their goal…. One simple act, and the troubles of the United Federation of Planets have grown darker overnight. 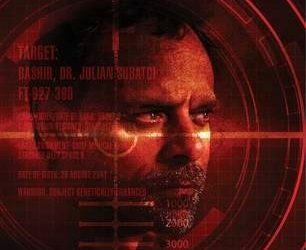 The mystery behind the heinous terrorist attack that has rocked the Federation to its core grows ever deeper, and William Riker finds himself beset by rumors and half-truths as the U.S.S. Titan is ordered back to Earth on emergency orders from the admiralty. 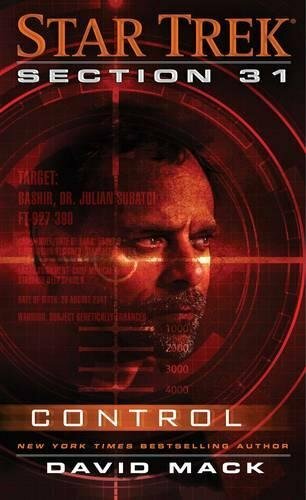 Soon, Riker finds himself drawn into a game of political intrigue, bearing witness to members of Starfleet being detained—including people he considered friends—pending an investigation at the highest levels. And while Riker tries to navigate the corridors of power, Titan’s tactical officer, Tuvok, is given a series of clandestine orders that lead him into a gray world of secrets, lies, and deniable operations. Who can be trusted when the law falls silent and justice becomes a quest for revenge? For the crew of the U.S.S. 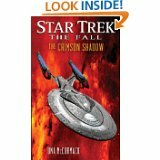 Titan, the search for answers will become a battle for every ideal the Federation stands for. . . .
What I love about contemporary Star Trek novels is that they expand the scope of the Federation to include much more than just Starfleet. We get to see how the different worlds of the Federation exist as compared to Earth, get a glimpse at the politics behind it all, get to meet characters who aren’t zipping around the galaxy in nifty starships all the time. But, we also get to see how the lives of our favorite, familiar faces have changed. We see Picard as a husband and father. We see Worf as the first officer of the Enterprise, and in this mini-series, we see Will Riker being promoted to Admiral, and get to spend some time with Captain Ezri Dax. We see Bashir (and Pulaski) flouting security orders for the greater good, and we see Garak as a politician. I said it, years ago, when I read Keith DeCandido’s Articles of the Federation: I would totally watch a series that was a sort of “West Wing in the Future” mixed with the more typical Trek stories, even if the episodes were half & half (think Law & Order). These books are the next best thing. Because they’re all one story, told in five volumes, it’s difficult to separate plot elements. The president of the Federation is assassinated just as the Federation is beginning to pull out of Cardassia. The Andorians are suffering a health crisis on a genetic level, and the new Bajoran president pro tempore has his own, somewhat mysterious, agenda. 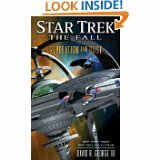 This series is political intrigue at it’s finest dressed in Starfleet colors, and it’s thoroughly engaging and entertaining. Thanks to the Amazon class action suit about ebook price fixing, and a lovely $60 payout, I’m catching up on many, many Star Trek novels that I missed during the years when I wasn’t reading them for whatever reason. One such acquisition was the Star Trek: The Next Generation novel Dark Mirror, by Diane Duane. It’s TNG’s chance to experience the “mirror universe” we got to see on-screen in both TOS and DS9, and, as I expected it to be, it was well written, with a few moments that really delighted me. One was the introduction of the dolphin, Hwiii, a hyperstring researcher who ‘swims’ through the ship in a sort of water skin. Another was when Data, meeting Hwiii, tilts his head for a moment and then ‘speaks dolphin,’ because, of course he does. I liked that Geordi and Deanna were the initial away team to the mirror Enterprise, and that they both got to use the knowledge they gleaned both from study and experience. Some of my favorite episodes were when Troi actually got to be a psychologist, and in this novel, she uses that training as much as she uses her innate empathetic abilities. Similarly, Geordi’s incredible depth of knowledge is highlighted in this book, as he works, sometimes with colleagues, and sometimes alone, to figure out a way to save, not just the ship, but the universe itself. I’m not sure when this was originally written but it felt like early TNG-fic. Data is very ‘sciency’ but doesn’t have as much depth as he does in later novels – even in later pre-emotion-chip ones. It’s obviously before the contemporary push for continuity within the novels, but it’s still an entertaining read. Trek fiction is my crack. This was a delightful fix. Goes well with Sashimi and tempura and Kirin beer. AT THE CENTER OF THE GALAXY . . .
A planet-sized Machine of terrifying power and unfathomable purpose hurls entire star systems into a supermassive black hole. Wesley Crusher, now a full-fledged Traveler, knows the Machine must be stopped . . . but he has no idea how. 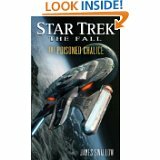 Wesley must enlist the aid of Captain Jean-Luc Picard and the Enterprise crew, who also fail to halt the unstoppable alien juggernaut’s destructive labors. But they soon divine the Machine’s true purpose—-a purpose that threatens to exterminate all life in the Milky Way Galaxy. With time running out, Picard realizes he knows of only one person who might be able to stop the Machine in time to avert a galactic catastrophe—-if only he had any idea how to find him. . . . The conclusion of David Mack’s Cold Equations trilogy was sort of TNG meets Doomsday Machine with Androids on the Side and a serious callback to Star Trek: The Motion Picture. Humanesque!Data, still searching for a way to resurrect Lal, tracks down a splinter group of the group of Artificial Intelligence coalition and has to choose between the guy we originally knew as Flint and the android girlfriend who is “the only woman he ever loved” while saving the universe from a planet-eating monster-machine. Don’t get me wrong, I love the return of Data, even if Mr. Mack did choose a book I disliked as his jumping-off point, but his whole relationship seemed so contrived, and Data as he is presented in this book seems so over-the-top with the melodrama that I had a hard time willfully suspending enough disbelief to truly enjoy this last entry in the trilogy. On the one hand, Mack’s story was a good story, but on the other hand, I just couldn’t get invested in the new characters, which was my problem with the trilogy as a whole. In fact, I find myself more interested in the story of rainbow-haired Ensign Scagliotti (so obviously an homage to the actress from Warehouse 13 than in Data, Flint, or the AIs. And yet, if I hadn’t read this trilogy, I’d have missed the return of a beloved character, and I do agree with the choice to have Data NOT return to active duty. So, overall? Glad I read these books, but kind of wanted something more satisfying. Goes well with…lemon meringue pie…doesn’t everything? 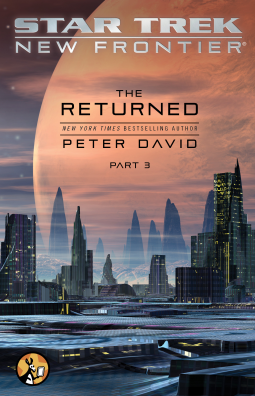 The second book in a new trilogy by the national bestselling author of Star Trek: Destiny! Three years after the disastrous final Borg Invasion, a bitter cold war against the Typhon Pact has pushed Starfleet’s resources to the breaking point. 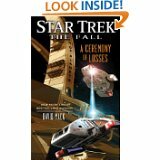 Now the rise of a dangerous new technology threatens to destroy the Federation from within. Captain Jean-Luc Picard and the Enterprise crew answer a distress call, only to become targets in a deadly game of deception. To protect a vital diplomatic mission, they must find a way to identify the spies hiding in their midst, before it’s too late. But Worf soon realizes the crew’s every move has been predicted: Someone is using them as pawns. And the closer they get to exposing their enemy, the deeper they spiral into its trap…. I don’t know how often the second book in a trilogy is stronger than the first. Certainly it’s more likely that second books (like second movies) suffer from “middle of the story” syndrome. In the case of David Mack’s STTNG series Cold Equations, however, did not have that problem in any form. Instead, it’s a rollicking adventure that mixes politics and action in a really satisfying blend of plot and character. I love that the Orions, whom we are used to seeing mainly as slavers and generally disreputable types are also the galaxy’s strongest defenders of personal privacy (reading this in the aftermath of the Sandy Hook, CT, school shootings was rather eerie), and have the only security system strong enough to host a meeting that involves not just the Federation President, but the leaders of at least one of the factions involved in the Typhon Pact. 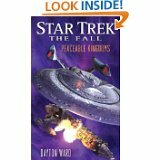 As well, I like that this novel acknowledged the Typhon Pact series, which spans all of the modern era Trek series and also combines political intrigue with really lovely action, whether it’s on land or sea, or in space. Is Data’s presence a bit contrived? Maybe a bit, but after all, the trilogy is about his return, so it would be weird for him to NOT be in the novel. Still, his new appearance and abilities are used well, and this new FullyEmotional!Data is one I wish we could get to know a bit better in a slower, gentler story…just so that we (well, I) are a bit more invested in THIS incarnation of the character. Goes well with: espresso con panna and cinnamon rolls. It’s no secret that I revel in escapist reading from time to time. Between January of this year, and the beginning of July, I’ve been re-reading the Star Trek: The Next Generation – A Time To… series, a collection of nine novels, the first eight of which are in pairs, that span the time between the last two Next Gen movies (Insurrection and Nemesis). You can read them individually, I suppose but they’re better savored as a whole collection, and while each of them have great moments, together they give a really plausible picture of how Starfleet reacted to the events of First Contact and Insurrection, explain why Data says in Nemesis that he has no feelings after two and a half films worth of emotion chip issues, and set-up the wedding of Will Riker and Deanna Troi, and their move to the U.S.S. Titan. It’s no secret that I’m a great fan of Keith DeCandido’s work, so it should come as no surprise that his book, the last in the series, is my favorite. His take on the canon characters is always spot-on, but he also adds a political background – think “The West Wing in Space” – that I maintain would be an awesome series in and of itself (he revists the political aspect of the United Federation of Planets in a subsequent novel, Articles of the Federation). Star Trek novels are my comfort-books, and I often read them when my day job has me so exhausted that I don’t have the brain power for reading deeper fiction, or writing my own stuff. There’s a ten-year span of TrekFic that I think of as the “DeCandido Years” where continuity was followed and all of the writers used some of the same original characters. These are, in my opinion, the best of the genre, and the A Time To… books are the best of the era.